The blow pipe is a hollow tube that allows to shoot small arrows. The tube is typically long (1 to 2 m, and more) because the muzzle velocity of the projectile is higher if the tube is longer. The accuracy also increases. Not exactly the handling. 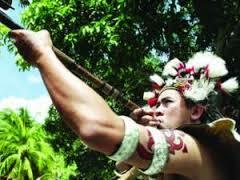 Arrows are 20-30 cm long and at the end provided with a conical tuft of fibers which is put fixed with a long hair. It is suitable to hunt squirrels and small birds, rats. A nozzle makes it easier to use. The range is up to 25 meters. For larger animals poison arrows are used, because the arrow itself is too light and has too little impact. This can only safely with poison that is harmless if absorbed through the stomach, otherwise the loot is inedible. Indian tribes in South America use curare and skin secretions of poison dart frogs. In Japan poison of fugu (blowfish) was used, in Indonesia and Malaysia, especially the juice of the upas tree (antiaris toxicaria). Bushmen in Africa also have their recipe. In our region, there is not a concrete experience (known). Yew is poisonous, and monkshood (Aconitum sp) certainly. But whether and how can be made a useful acting poison of is? So better not touch it. As arrow poison Celts and Gauls would have used hellebore (Helleborus adans) and Christmas rose (Helleborus niger, known ornamental plant! ), according to Pliny the Elder in ‘Naturalis Historia’. The Greek physician Dioscorides wrote in ‘De Materia Medica’ that an extract of oleander was used in Spain as arrow poison. Confirmation from another source or by archaeological research is not (yet) found to my knowledge. The highly poisonous aconite (monkshood) occurs sporadically in our region. The plant contains aconitine, like larkspur. Different substances having a similar effect are in the white hellebore (Veratrum album). The mashed roots are usable working directly, the poison should not be even first concentrated. It is believed that arrow poison (curare) was made of ​​several poisonous plants. Only after the describing of plants and their use, it is possible to find information on depth about it. Which is often vaguely, by unclear descriptions, or uncertain, by the use of local and other names. Aconite was described repeatedly. Now widely available as an ornamental plant. Formerly one knew its toxic properties very well, because the deadly poisonous roots sometimes were harvested as edible tubers. The whole plant is very poisonous. A few drops of juice from the Aconitum napellus can be fatal. The poison can even be absorbed through the skin. It attacks the nervous system, causing cardiac arrhythmias and lowering blood pressure. Blue Aconite contains aconitine and is just about the most toxic plant in Europe. Possibly the name comes of the Greek akon: arrow. Aconitum is loosely translated to ”invincible poison '. Aconite arrow poison was as familiar to Chinese, Greeks, Persians, Moors and Gauls. It was used for hunting, wars and at no (longer) required spouses. Theophrastus writes: ”One can prepare aconite so that it brings death on set time, in 2, 3, 6 months, 1, or even two years.” According to Pliny aconite is the fastest acting poison. It could kill a human or animal within half an hour after intake. The Gallic law forbade the use of poisonous arrows to tribesmen, but not to strangers. Nederlansch Magazijn, Volume 3 (1839) calls (plant acids as) vinegar, wine and (berry) juice as an antidote. Garlic and rue are also mentioned in ancient writings. In more recent (and contemporary) literature, however, you will find that there is no antidote! Monkshood is also an ingredient for (hallucinating) ointment that make witches (think to) fly through the air (or got that feeling). Warning when using weapons.... BEWARE!